It has been a while since I made a blog post... I struggled with 'what kind' of blog I want this to be... Crafts? Personal stories? Design? I couldn't decide, so I have been procrastinating. Today I decided that I am going to write about what interests me... which is all of the above. So... Almost a month after my first post, I will begin with a book review. Let me begin with saying: I am a huge advocate for reading. Every holiday as a child I would receive a book with an inscription written in the front cover and it was always a treasured gift. Books make such a lasting impression on little minds, especially when the love and prayers of their parents are included in their favorite books. Perhaps because of this, I hold a special place in my heart for children's books. 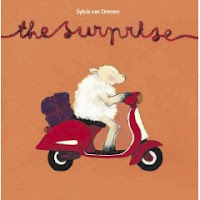 I want to share a few of my favorites in the following weeks, and thought I would start with a little-known, 'all ages' picture book: "The Surprise" by Sylvia van Ommen. "The Surprise" is a wordless 32 page mystery. The illustrations are simple and sophisticated using bold colors and simple backgrounds to 'spin the tale' (pun intended) of the adorable sheep who is crafting a gift for a friend. This book is the perfect example of 'pictures speak louder than words.' The sheep is given a distinct personality as she measures her wool coat, rides her vespa to the dye store and to the French pink poodle who spins her dyed wool into yarn ... and finally gives the gift she knitted to her best friend. Each picture shows the process of wool clothing from the shearing of the sheep, through the dying, spinning and knitting into a final product. It is a mystery for the little reader who wonders from page 1, "Why is she measuring her coat?" to the end where her wrapped package is taking a vespa ride to its final destination and you finally see what the sheep made for her tall friend. A wonderful story from an extremely talented illustrator in The Netherlands. I've never heard of a wordless picture book before and I love the vespa -- I just ordered it from amazon - thanks for the recommendation!